Marissa Koscielski's back injuries led to chronic pain that eventually forced her into a wheelchair. Participating in Mayo Clinic's pediatric pain rehabilitation program helped her overcome the pain and put her back on her feet. 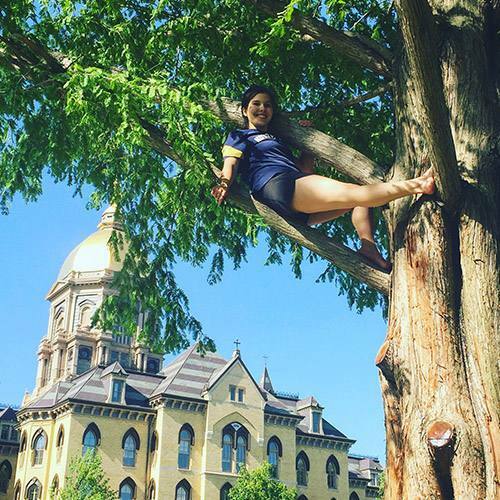 Marissa Koscielski leaped into the air on the steps of the Golden Dome at the University of Notre Dame. In a photo that captures the moment, Marissa wears a graduation cap and holds a diploma above her head. Her smile is bright, her legs bent in midair high above the steps. Marissa had just earned a bachelor's degree in mathematics from the prestigious university, which would have been reason enough to celebrate. But the leap represented so much more. Just five years earlier, Marissa was living with constant pain and had been told she might spend the rest of her life in a wheelchair. Back then, she couldn't imagine walking, let alone jumping. Then she discovered the pediatric pain rehabilitation program in the Pain Rehabilitation Center at Mayo Clinic, where she turned for help getting back on her feet again. Marissa's journey to Mayo Clinic began the spring of her eighth grade year. Her gymnastics season was wrapping up, and Marissa's coach had given the team a free day in the gym. "I decided I was going to front tumble, and I kept falling," she says. The falls hurt. But with a high tolerance for pain, and an athlete's determination, she continued practicing. "I joked that I thought I'd broken my tailbone," Marissa says. It turned out that she had. X-rays also revealed fractures on both sides of her sacrum and multiple fractures in her lower spine, injuries she'd likely sustained earlier in the gymnastics season. The fractures were treated, but the pain in Marissa's back persisted. That led her to doctor after doctor in her home state of Indiana. None could identify a reason for the continued pain. By the spring of Marissa's ninth grade year, the pain had become so unbearable she left school and enrolled in an online education program. She'd become virtually homebound. That summer, her parents brought her to Mayo Clinic's Rochester campus. "At Mayo they started from scratch, trying to figure out what was going on," Marissa says. When her tests results came back, none revealed an answer. Marissa and her family went back to Indiana, where she started her second year of online education. The pain remained a constant companion. And gradually, a new and frightening symptom arose: Marissa began to lose feeling in her legs. By the end of her sophomore year, she had no control of her left leg. She was using a wheelchair, and doctors told her she might never leave it. Desperate for answers, Marissa's family went back to Mayo Clinic. "They ran more tests, and noticed a small spot on my MRI that had grown since the last test," Marissa says. "They thought it might be a deep infection in my back and decided to do surgery to remove the mass." After the mass was removed, Marissa attended a six-week inpatient rehabilitation program at Mayo Clinic. When the program ended, she was still in pain, and she still couldn't control her left leg. That's when her care team told her about the pediatric pain rehabilitation program. She decided to enroll. The pediatric pain rehabilitation program is a three-week, outpatient program for adolescents and their parents or guardians. It's intense, with full days of physical, occupational and recreational therapy, as well as group therapy and lectures on stress management. There are separate lectures and group sessions for parents and guardians. At first, Marissa was overwhelmed. "I thought, 'How am I going to do this?'" she recalls. But she did whatever was asked of her. Before long she saw — and felt — results. "I started to get movement in my legs again." Over the course of the program, Marissa got stronger not only physically, but mentally as well. That's by design, says Wendy Timm, a physical therapist who has been part of the program since it was piloted in 2008. "The kids in the program have been dealing with pain for a long time and have often withdrawn from friends and activities," she says. "Many of them are depressed when they come to us. They learn coping skills in the program. We introduce things like meditation and relaxation techniques to help them manage their pain." Participants also take inspiration from those around them. Admissions are staggered, which means there is always someone to look ahead to in the program. Those who are further along in their recovery encourage the newcomers. "To a person, parents and kids all tell us what a difference the group support makes," Timm says. Marissa agrees. "It was great to meet kids the same age who really get what you're going through." The program also includes mandatory social outings, such as group trips to go rock climbing, ice skating or to the mall. "Many of these kids have become isolated, and part of what we do is help them learn to socialize again," Timm says. "We want to get them back to who they were before pain took over." The approach works, as evidenced by the graduation speeches each participant gives before leaving the program. "We have kids come to the program in wheelchairs who leave walking or running," Timm says. "It's thrilling to see." And emotional, as well. "Parents cry. Kids cry. We cry," she says. "It's incredibly rewarding to be a part of." Less than a week after she completed the program, Marissa returned to school for the first time in a year and a half. 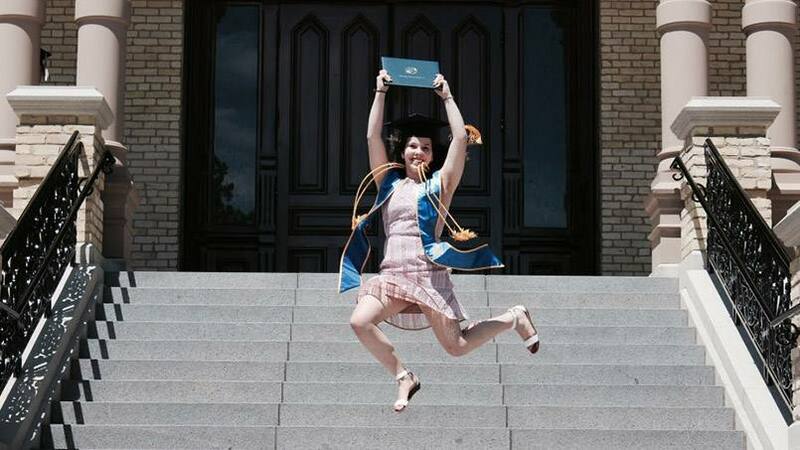 She graduated with her high school class, and four years later, from Notre Dame. She credits the program with helping her successfully navigate college life. "I still follow the plan they set for me," she says. It's a plan that includes daily exercise and eight hours of sleep each night, habits that set her apart from many of her fellow students. "While my college career did not consist of wild behaviors, I believe I have grown far more than some of my peers physically, socially and mentally." Today, Marissa is a graduate student in the university's Esteem Graduate Program for technology and entrepreneurship. She's eyeing a career in health care. "I want to help bring health and dignity back to patients," she says. Her master's project — creating a modified walker to be used in rehabilitation after amputations — will help her accomplish that goal. The design was inspired by her own experience using a modified walker at the Pain Rehabilitation Center. Marissa has continued to move forward physically. Once she felt well enough to move again, she wasn't content with walking. She's become a runner, logging up to 8 miles at a time. She plans to enter her first road race soon. "My health has improved so much over the past few years," Marissa says. "This program is a hidden gem. It enabled me to go from being a survivor to living again." Learn more about the pediatric pain rehabilitation program. Read about the Pain Rehabilitation Center.